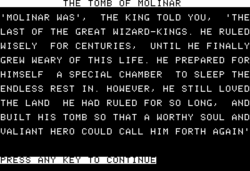 The Tomb of Molinar is an Eamon adventure written by Donald Brown. The adventure features a single sound effect: a brief, four-note musical effect played when the adventurer successfully captures the dragon. This page was last edited on 23 April 2019, at 06:38.